The civil engineering firm of Robert McAlpine commenced business in 1868, in Scotland. The first contract is said to have been for a signal cabin for one of the Scottish railway companies, and gradually business expanded along with the growth of railways and industry in Scotland. As the firm became established bigger contracts were handled, including many railway construction projects for the Caledonian, North British, Lanark & Dumbarton and other Scottish lines, as well as contracts at the Singer factory at Clydebank and the Dawsholm Gasworks in Glasgow. All operations were based on Glasgow, and it was not until after the First World War that the main workshops were moved to Ellesmere Port, later being based at Hayes. The main offices are now in London, but a Glasgow office is still retained. In 1900 the firm came south of the Border to build the dry dock at Hebburn and went to Ireland in 1903 for construction work on the Waterford & Rosslare Railway, later completing the Strabane & Letterkenny Railway in 1906-1908. In the same period Scottish work included much work on railway projects, harbour works and at the Kinlochleven Aluminium Works. In 1908 the construction of Dunston power station at Gateshead was commenced: this was the first of many contracts for power stations, and a sign of changing times. Railway work dwindled, to be replaced by the construction of reservoirs, docks and power stations, nearly all of which were in England and Wales. Upon the outbreak of war in 1914, the firm became involved in the construction of munitions, aircraft, and other strategic factories, and did some work in France. After the war a number of large factories and chemical works were constructed, and several major road and housing projects undertaken. Contracts of particular interest to railway enthusiasts were those for the Welsh Highland Railway in 1923, and for the Crumpsall Vale Railway, Manchester, for British Dyestuffs Corporation (Blackley) Ltd in 1919-1921. Around the period 1921-1924 they were working on the Wembley Exhibition buildings, the Gosforth Light Railway and the Mersey Tunnel, while in 1924 work was commenced on a major overseas project for which locos were purchased[*], the Takoradi Harbour construction in Ghana (Gold Coast). From then until the Second World War a considerable number of road and dock projects was handled, and the Southern Railway Broadstairs - Ramsgate and Wimbledon - Sutton lines laid. Several sugar-beet factories were erected, and railway facilities built for London Transport. In 1936 a very large contract was commenced at the Ebbw Vale steelworks for which many locos were required; and by way of contrast work was performed at the new Elstree film studios. At the beginning of the Second World War the government again required the firm's resources and power stations, ordnance factories, and other key plants were hurriedly built. Railway work included the Gloucester-Cheltenham rail link. The aftermath of war included a chronic power shortage, and a large amount of work for new power stations was obtained as well as the operation of several opencast coal sites. Together with work for the railways, river boards and steelworks, these provided work for many of the remaining standard gauge locomotives, until their use was finally dispensed with. In 1868 construction equipment was rudimentary, and contracts were small. 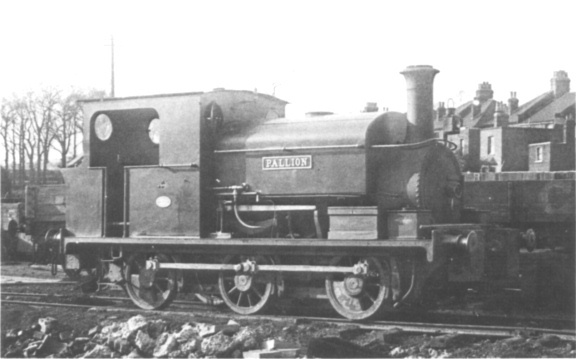 It was not until the 1880's that contracts became large enough to need the use of locos, and Barclay's supplied three or four of their standard 0‑4‑0 saddle tanks. These, with perhaps a few hired or second-hand locos sufficed until the late 1890's, when a batch of locos was bought from Hudswell Clarke, some of standard gauge, and some for the 3ft gauge. 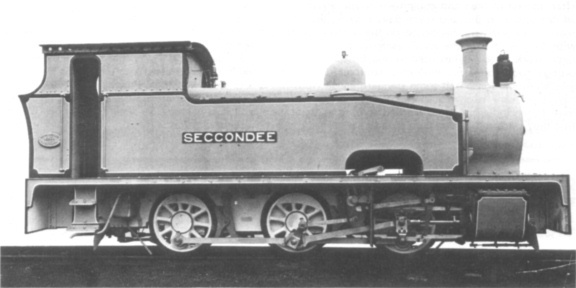 They were apparently successful, and the bulk of the steam locos acquired subsequently were from this builder. The railway projects naturally used standard gauge machines to haul materials, as well as spoil for embankments and cuttings, and the narrow gauge was used on jobs where standard gauge track could not usefully be employed. Everything went by rail, including concrete, dirt and materials. Most equipment was steam operated and manual labour more liberally used than today. The 3ft gauge seems to have been popular among civil engineering firms of the day, and steam locos of this gauge were bought until 1924. The surplus Simplex petrol locos available after the First World War no doubt caused the change to the 2ft gauge, and, apart from acquiring some of these, McAlpine's purchased new locos from Motor Rail both for the 3ft and later in quite considerable numbers for the 2ft gauge. 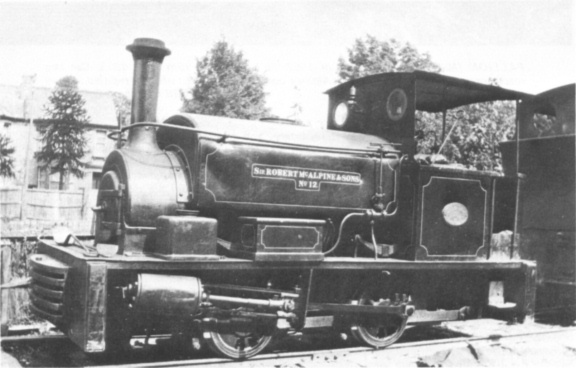 The latter gauge was no doubt of lower capacity, but with the predominance of other means of hauling spoil narrow gauge lines have tended to be used for lighter work in any case. McAlpine's Simplexes have in the last decade been used for placing concrete and getting into the odd corners and tunnels. Several locomotives were purchased for specific contracts and did not receive numbers in the McAlpine list. On the 2ft gauge there were some steam locos as well as dozens of petrol, diesel and battery locos, the battery locos including some built by Hudswell Clarke for the Mersey Tunnel contract. 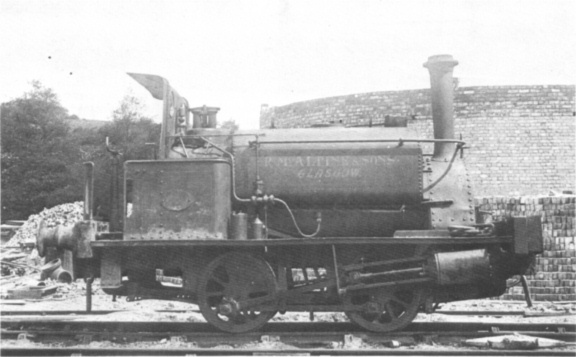 The 3ft 6in gauge locos 60‑67 were for the Takoradi contract, the Gold Coast Railways being of this gauge, and were unusual in that they were side tanks. 64 and 65 were returned to this country and, together with some of the 3ft gauge locos (presumably converted to 3ft 6in gauge) featured on several contracts, including the railway from Wimbledon to Sutton, before being scrapped. McAlpine's "standard" loco was an inside cylinder 0‑6‑0 saddle tank and for many years after World War 2 many were to be seen in the siding at Hayes, the numbers gradually dwindling as they were sold for scrap. Quite a number over the years were sold to customers when the job was finished, and some were still to be seen recently in power stations and sugar factories; one of these will be the last of McAlpine's former locos in service. I would have liked to have been able to catalogue the work of the various locos. Contractors' equipment always has a hard time, as it works in site conditions, where it is difficult to provide adequate maintenance. On return to the depot at the end of each job it receives a major overhaul if it is thought that it will be required; otherwise it may be sold or scrapped. The nature of the construction industry gives uncertain employment to equipment; a large contract may require many locos (one at Tilbury Docks in the 1920's used twenty-seven locos), or only one or two (as did most power stations). The Ebbw Vale job called for locos far in excess of any the company could use continuously (over thirty-six were used there altogether) and consequently a number of surplus main line locos were bought for the job and sold afterwards. The War Department obtained several as they were desperately short of locos at this time. The wanderings of No.9 (Hudswell Clarke 492 of 1898) may be of interest. It was purchased in 1898 for use in constructing the Fort William-Mallaig railway line. In 1903 it was on the Provan Gasworks job in Glasgow, then went to a reservoir contract at Motherwell. By 1909 it had emigrated south to another reservoir job at Molesey in Surrey. It was next heard of at the War Department MT Factory at Slough in 1919, and may then have gone to the London County Council Estate contract at Bellingham, where seven locos were employed. In 1925 it was on the Kent coast for the Broadstairs-Ramsgate railway, and in 1928 had gone to the Southampton Docks, where fifteen locos were used on the construction of a new quay. It was there for some time but in 1936 it joined with six others working on yet another reservoir job, this time at Northampton. When this was finished it went to Scunthorpe Steelworks (where there were eighteen locos) and is then said to have been sold to John Mowlem & Co Ltd.[†] Quite a record! 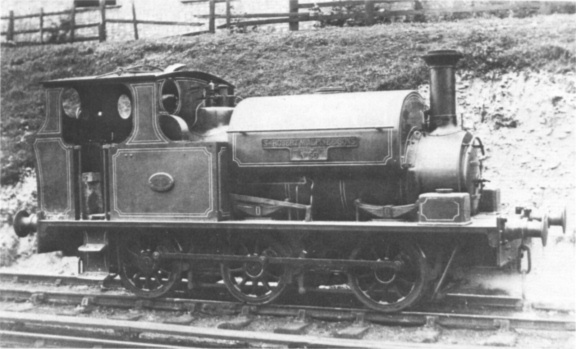 However this was typical of the standard gauge locos. In many cases the lines on which they operated were self contained and their main purpose was hauling spoil. Otherwise they shunted traffic from the main line and moved internal traffic on the site. Operations must have been complex, especially where more than one gauge was used, and a line-up of locos would be a sight to remember. The present-day firms of Sir Robert McAlpine & Sons Ltd and Sir Alfred McAlpine and Sons Ltd are both offshoots of the original firm. Their days of steam are over - but not forgotten. * The only other overseas contract on which a loco is known to have been used was the construction of a breakwater at Kandia in Crete for which Henschel supplied a metre gauge 0‑6‑0 tank in 1925. † No.9 was noted at McAlpine's Hayes depot in 1939 and probably went shortly afterwards to Mowlem who used it on the construction of the Swynnerton Royal Ordnance Factory in Staffordshire during the early years of World War 2: it disappeared from Mowlem's Welham Green depot, London, about 1944, presumably scrapped.